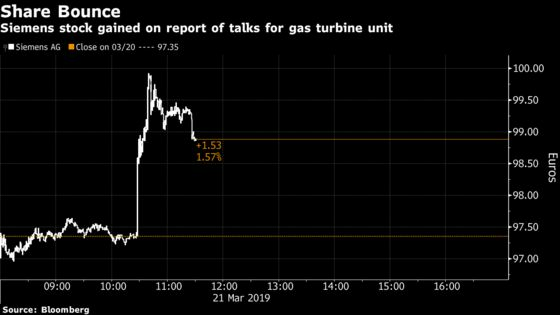 (Bloomberg) -- Mitsubishi Heavy Industries Ltd. is in talks with Siemens AG on a possible combination of the German company’s large gas turbine business with its own operations, according to people familiar with the matter. Siemens has held talks with several firms including Mitsubishi, said the people, who asked not to be identified because the discussions are private. Options range from a full or partial sale of the division to a joint venture, the people said. No final decisions have been made and Siemens may still decide to keep the unit, they said. Siemens has been considering options for the large gas turbine business, which forms the biggest part of its power-and-gas division, since at least last June, when people familiar with the matter said the German engineering company was considering a potential sale. At the time, Berenberg analyst Simon Toennessen estimated the business to be worth about 3.2 billion euros ($3.6 billion). A spokesman for Mitsubishi Heavy declined to comment. Shares of Mitsubishi Heavy closed half a percent lower on Thursday while Siemens advanced 1.1 percent after jumping as much as 2.6 percent intraday, the most in more than a month, following the Bloomberg report. The possible gas turbines deal would come after a collapse in the market for the giant power plant components as renewable energy becomes cheaper. Siemens announced in 2017 it would cut 6,900 jobs in its power and gas division to respond to the shift. The company is under pressure to provide clarity on the future of the division ahead of an investor day on May 8. Antitrust issues could play a role in any dealmaking. General Electric Co. was the top producer of gas turbines last year, with about 33 percent of global orders by capacity, according to Barclays Plc. Mitsubishi Hitachi Power Systems followed with 30 percent, while Siemens was third with 26 percent. The German company was set to generate about 5.2 billion euros in revenue from turbine sales and services in 2018, Berenberg estimated last year. Siemens’s power-and-gas division will be renamed gas and power on April 1, reflecting the company’s new structure. The firm announced last year that it was shrinking the number of operating divisions to three from five and that it would focus on factory software and energy distribution, attempting to get the jump on newer technologies that had been disrupting its core business.